Situated at the intersection of Broadway and Cache, the Town Square is Jackson's outdoor living room and the perfect respite from a day of exploring. Shopping, dining, galleries, entertainment and history, all rolled into four corners. Situated at the intersection of Broadway and Cache, the Town Square is Jackson’s outdoor living room and the perfect respite from a day of exploring. The core of both the town and the community, the square is marked by four magnificent elk antler arches and crisscrossed by an Old West boardwalk that culminates at the central sculpture of the square, a war memorial of a cowboy on a bucking horse. The Square's iconic elk antler arches date back to 1953 when local Boy Scouts teamed with the Jackson chapter of Rotary International and a number of community members to erect the very first arch. Three more followed over the next 13 years. The arches feature prominently in untold numbers of vacation photos and even a few Hollywood Westerns. The town of Jackson turned 100 in 2014. In typical Wild West fashion, the motivation to incorporate the town in 1914 had a little something to do with a saloon. Interested in learning more? 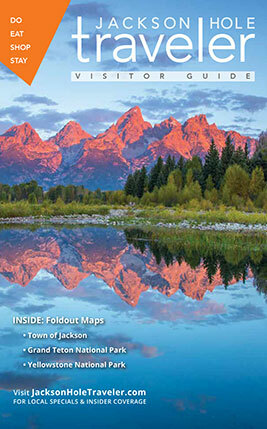 The Jackson Hole Historical Society & Museum hosts free historical walking tours around downtown Jackson. Call 307-733-2414 for more information. Pictured: Maurice Williams and Joe Clark playing baseball in front of the Clubhouse in downtown Jackson. Photo courtesy of the Jackson Hole Historical Society. From Western to contemporary, homewares to hats, jewelry to bronze sculptures—whatever your taste, you'll find an incredible selection of shops and boutiques on Town Square to satisfy your needs and desires. There are also numerous eateries and live music venues lining the square, including the world-famous Million Dollar Cowboy Bar and the Silver Dollar Grill in the Wort Hotel. Surrounding the square are two other shopping "districts"—The Pink Garter Plaza and Gaslight Alley. Located in the center of the action downtown, the Pink Garter Plaza has all your shopping, eating and entertainment needs, with a top-rated music venue (Pink Garter Theatre), a pizzeria that was featured on the Food Network's "Diners, Drive-Ins and Dives" (Pinky G's) and a couple of only-in-Jackson Hole stores. Gaslight Alley is a quaint shopping area nestled just off the square. The stores lining the alley feature handcrafted jewelry, artworks, mouth-watering chocolates (Mursell's Pottery & Chocolate) and more. There is also a gem of a bookstore brimming with all manner of titles (Valley Bookstore). During the summer, you'll also find the popular Saturday Farmers Market with its organic produce, local foods, flowers, and entertainment. This year, the market begins on July 6 and ends September 28. In May, the Elk Antler Auction fittingly benefits the local chapter of Boy Scouts of America. The scouts hold a special roundup on the National Elk Refuge to collect antlers shed by the elk, then auction their bounty off to bidders from far and wide. The square is also the contact point for the stagecoach ride around town, with two handsome, yoked horses leading the way. From Memorial Day to Labor Day each year, the streets are cleared at 6 p.m. to accommodate the Jackson Hole Shoot-out Gang. With characters as dastardly or virtuous as you’ll find in any tumbleweed saloon, the gang puts on a show that culminates with an authentic shoot-out, the longest running of its kind in the country. No telling if the white hat or black Stetson wins. The best time to see the square is at Christmas. The many tall trees and the arches provide the perfect structure for twinkling lights, and there’s a special lighting celebration, complete with Santa Claus, seasonal carols and lots of good cheer. Winter on Town Square also features an outdoor skating rink, with skate rentals available at a nominal cost in the Stagecoach building. Pearls By Shari No trip to Jackson Hole is complete without a bracelet from our Teton Bracelet Collection! Ideal as a gift for yourself or friends, these stylish bracelets of leather and pearl represent a unique piece of Jackson’s history melded with Shari’s extensive design expertise. Go ahead and begin building your collection today at our showroom right on the Town Square. Starting at $29.95.